Ways to include content in the Learn.UQ text editor as part of collaboration or assessment tasks for your course. We recommend you use the Kaltura Media mashup > Record from webcam feature instead. View the Kaltura webcam instructions. A webcam recorder window will open. From this window you can record a video using your webcam and microphone and upload it to your Google/YouTube account or browse your account for a current video. Click the Preview button (a computer screen icon) in the text editor to test your link to ensure that your instructor can locate and mark your work. (Links are not active while editing). 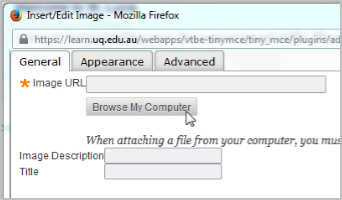 Click the Preview button (an icon for a computer screen) to test your file link. Click the Insert/Edit Image button on the text editor. The On the Insert/Edit Image box will pop up. If the button is not visible click the Show More button on the right of the editor to enable Advanced View. It is not recommended you paste a web link - as the link will break if the file is moved. We do not recommend the use of this tool. Use the Mashups button > Kaltura Media option instead. The equation will be inserted into the editor as an image. 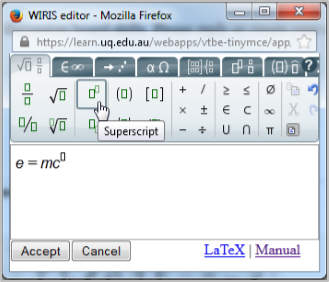 The WIRIS maths editor will pop up in a new window with your equation pre-populated.